All games are double headers. All games played at Jones Field, 461 Jones St. Hubbard, Ohio. 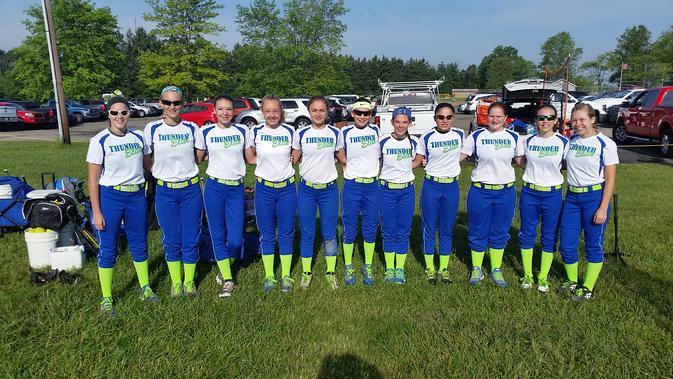 Thunder Elite 03 finished Runner-up at May Mayhem in Rootstown, Ohio May 19-20. The team played very good ball all weekend despite being short-handed with many missing players due to the Ohio High school season and other school functions. Being able to make it to the championship game was no small task with a small roster, three subs, two pitchers on Saturday, and 1 catcher for the entire weekend. The team went undefeated in pool play giving up just 3 runs. To make the finals we had a thrilling 10-9 victory in ITB where the girls fought back from a 3 run deficit in the last inning to tie with a 2-out steal of home...and then winning in extra innings with a 2-out, 2-run single for the win. We have a lot of work to do to get ready for the upcoming tournament season and this was a nice tune-up for us as we come back together as a full team. Our offense looks very impressive and our very small pitching staff will have A LOT of innings ahead of them this season. 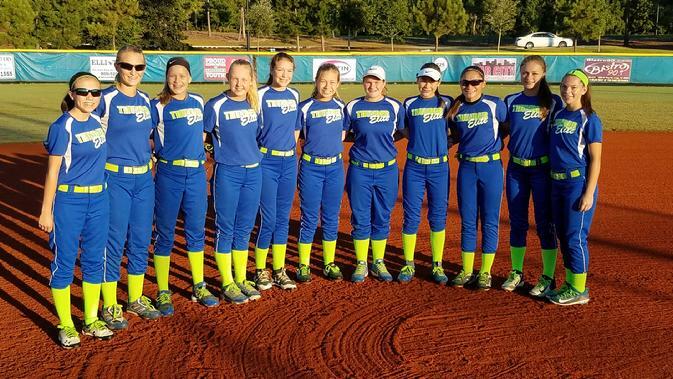 Thunder Elite 03 finished up their 2017 outdoor season with a Final 4 finish in the WFC World Series at Myrtle Beach, SC August 1 -- 5. Despite a challenging pool play schedule where the team played the eventual #1, 2, 4, and 5 seeded teams, the team still finished 2-2 in pool play and entered elimination as a low #10 seed. Our girls fought their way to the Final 4 with wins over #4, 5, and 7 seeds and a HUGE 7-5 upset of #2 seed from Virginia. They played all week with strong defense and pitching along with potent hitting. Unfortunately their week came to an end after a disappointing 5-3 loss to West Virginia where multiple scoring opportunities were missed stranding 10 runners on base. The team now turns its sights to next season and will be playing in the Thunder Elite Fall Ball league and an invitation to the '03 Friendlies in Toledo this October. 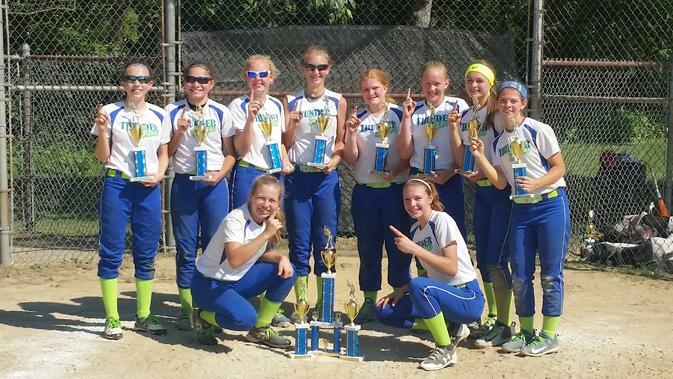 Thunder Elite 03 had a super weekend going 6-1 and Winning the 14u championship at the Starzz Invitational ASA ENQ in Willoughby, Ohio June 9-11. 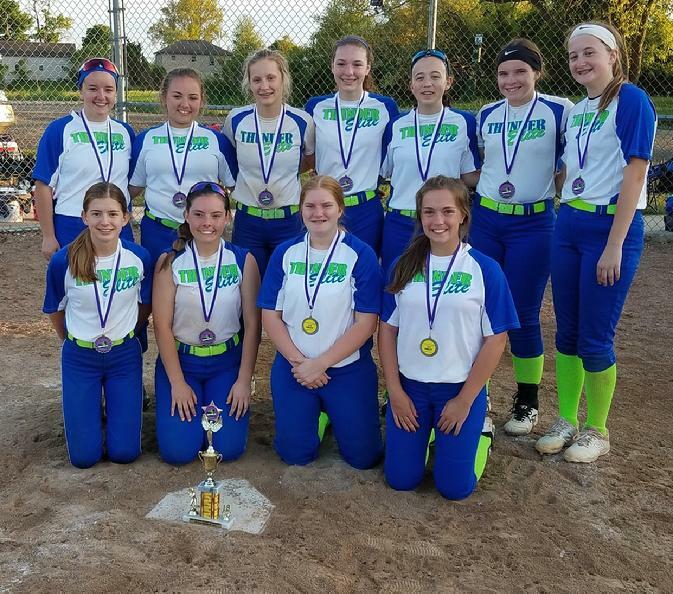 The girls overcame the heat and won four straight games on Sunday, including a one-run victory over the Erie Frost and an ITB thriller vs. the Starzz 02. To claim the title, Thunder Elite 03 had to face the SPC Hotsox 14u in the finals...a team they lost to Friday evening to begin pool play. The girls came out early scoring 5 times in the top of the 1st and held on to win the 7 inning scorcher 6-2. This was a total team effort with EVERY player contributing to the team's performance. This win is a big lift to our team that has dealt with a number of hiccups this spring enduring missing players due to schedule conflicts, many substitute players, injuries, and foul weather. It was great seeing this team firing on all cylinders...they are an exciting group to watch. The players of Thunder Elite 03 are athletes from Northeast Ohio and Western PA from the 2003 birth year. Pictured above are Amelia Timko (Brunswick) Grace Crown (Maplewood), Abbey Nay (Maplewood), Clutch Ventura (Maplewood), Sierra Williams (Lakeview PA), Mackenzie Herman (Reynolds PA), Sam Holden (St. Christine's Youngstown), Haley Croyle (Hubbard), Elyssa Molody (Austintown), Lexi Najdusak (Hubbard), and Chloe Howlett (Westlake). 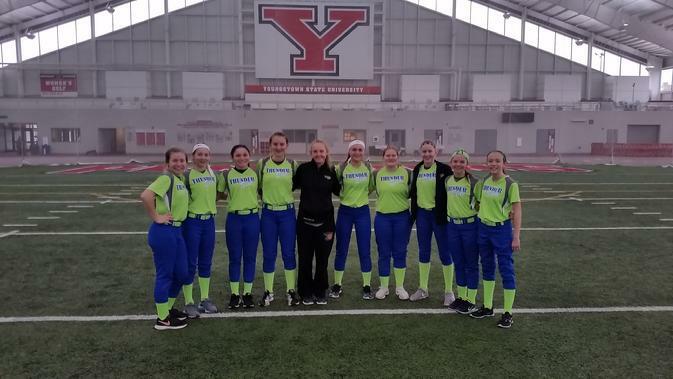 Thunder Elite 03 had a productive weekend at the Streak Summer Bash PGF in Canfield Ohio making the Semi-finals and finishing with a 3-1-1 record. The team was the last 03 team left in the tournament, making the final four against three, very strong 02 teams. Despite rain cutting pool play short, the team had a very consistent offensive attack and demonstrated strong defense all weekend. Their next tournament is the Perfect Storm in Youngstown June 2-4. 2-0 at the 2017 Thunder Elite 03 Friendlies. Great Job Ladies! 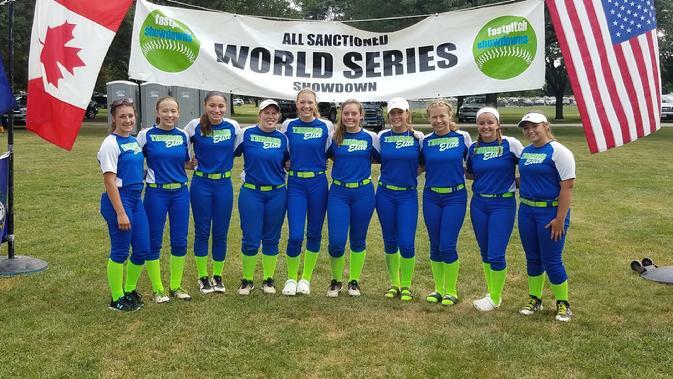 Thunder Elite 03 wrapped up their 2016 outdoor tournament season by going 4-1 at the All Sanctioned World Series in Columbus, Ohio on July 28-31. The team finished their outdoor tournament season with a 33-12 record. The team also participated in the Winter Spano Tournament, the 03 Friendlies in Toledo, the Thunder Elite Friendlies in Rootstown, and a 6-2 record at Laser Nation in Columbus. The team is made up of girls from northeast Ohio and western PA from the 03 birth year. Pictured above are: Jordan Cholley, Bailee Beasom, Clutch Ventura, Abbey Nay, Lexi Najdusak, Sam Holden, Grace Crown, Ashley Deans, Sierra Williams, Mackenzie Herman, and Haley Croyle. 03 will return for 2017 as a 13u team and looks forward to working, and devleoping into better ballplayers. 03 will be holding its tryouts on Friday, August 5 from 6-9 pm and Saturday, August 6 from 1-4pm at Liberty park. You can find more information on the Tryouts link. If your have an interest in trying out please contact Coach Nay to discuss team needs. Thunder Elite 03 just completed a very successful weekend at Laser Nation in Columbus Ohio. The team went 6-2 on the weekend with three, 1 run victories and coming from behind for another 3 wins. The team continues to improve each week and their participation in the three, very challenging friendlies early in the season has really elevated their level of play. On the season the team is 18-13 overall and 17-5 in outdoor tournaments. This includes many games against Ohio OFC Top 10 Teams along with numerous games against top teams from Indiana, Michigan, PA, WVA, and Kentucky. 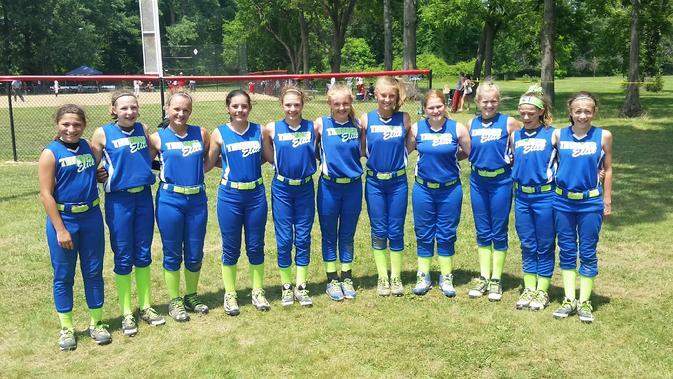 The girls will be back in action June 25-26 at Sluggers Summer Bash in New Middletown, Ohio. The above picture was taken before game 6 at Laser Nation and it includes; Clutch Ventura, Jordan Cholley, Ashley Deans, Bailee Beasom, Grace Crown, Sierra Williams, Mackenzie Herman, Sam Holden, Haley Croyle, Lexi Najdusak, and Abbey Nay. 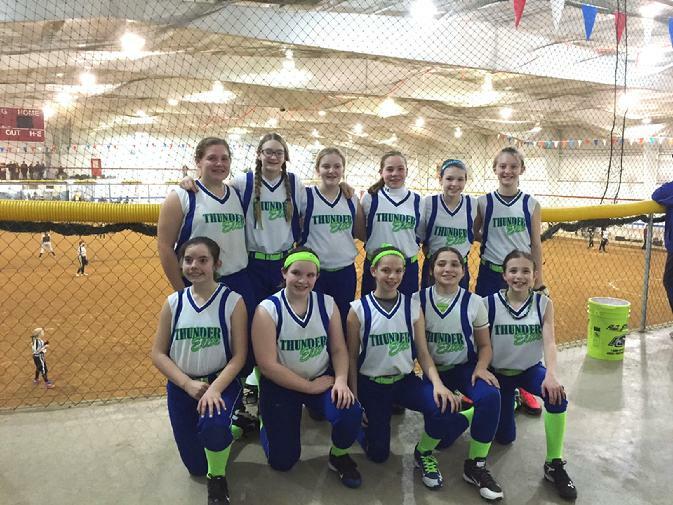 Thunder Elite 03 competed in the indoor Spano Tournament the weekend of Feb 19-21 against an impressive 20 team field of 12u teams. This was our team's first competitive play since November as all of our players are in multiple school sports. The girls played super from the 1st game and wound up claiming the #1 seed from our pool. Unfortunately our Sunday ended early with a disappointing loss ending our weekend with a 3-1 record. 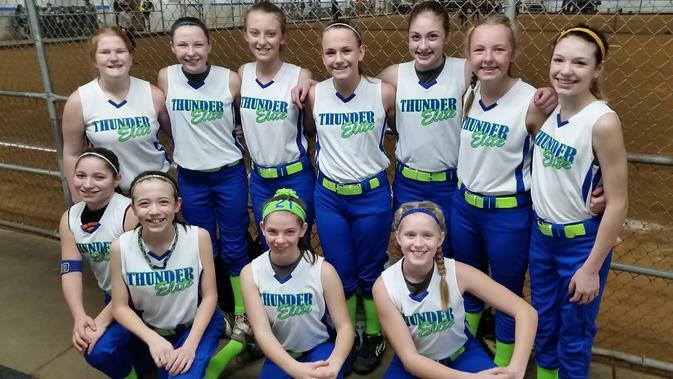 Thunder Elite 03 will continue to work at our indoor facility in Youngstown and will participate in a number of 12u friendlies before our 1st outdoor tournament, YTown Mayhem, April 23-24. Thunder Elite 03 is made up of 2003 birth-year girls from north-east Ohio and western PA. The picture above was taken at Spano. The players are Lexi Najdusak, Haley Croyle, Jordan Cholley, Sierra Williams, Mackenzie Herman, Bailee Beasom, Ashley Deans, Grace Crown, Clutch Ventura, Abbey Nay, and Sam Holden. 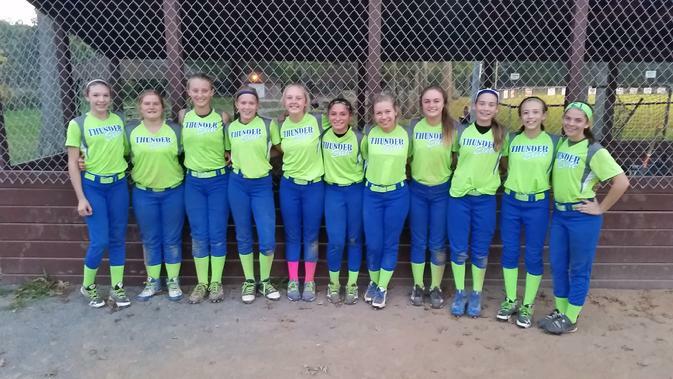 Thunder Elite 03 had a good weekend in Boardman, Ohio at the Lady Spartan ASA ENQ. The team went 3-1-1 with nice games against the Blast Mason, Xplosion, and Streak 02. 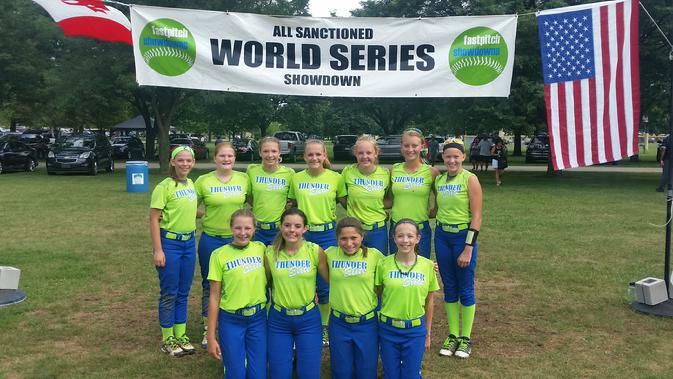 Our lone loss on the weekend was in the semi-finals to the eventual tournament champion Ohio Lightning Gold. Overall the team played well and it was nice to see the bats come alive against some of the older 12u teams in attendance. Our season record now stands at 21-9-2 as we get ready for another ASA ENQ at Liberty Blazing Bats July 17-19. After this weekend we will be gearing up for our World Series appearance in Columbus Ohio at the end of July. Thunder Elite 03 will be in Willoughby Ohio this weekend for the Reach For The Starzz ASA Qualifier. So far Thunder Elite '03 has enjoyed a successful season for being such a young team in the 12u division. We have an overall record of 16-7-1 in tournament play which includes winning three consecutive #1 seeds. The team has displayed consistent improvement with its hitting and defense along with the pitchers who continue to grow each game. We had a great weekend in Sandusky at the Coaster Classic where our only two losses on the weekend were to the OFC Top 10 Cincy Doom 02 and the eventual tournament champion, Wildcats, by a score of 3-1. Thunder Elite 03 spent an exciting weekend in Toledo playing in the 03 Friendlies sponsored by the Wizards. An impressive list of teams attended this eight team friendly and our girls were honored by the invitation to play amongst some of the best 03 teams in the state of Ohio. Along with Thunder Elite 03 was Wizards 03, Stingrays 03, Sundogs 03, Lasers Black, Outlaws 03, Central Ohio Vipers 03, and the Lady Knights 03. 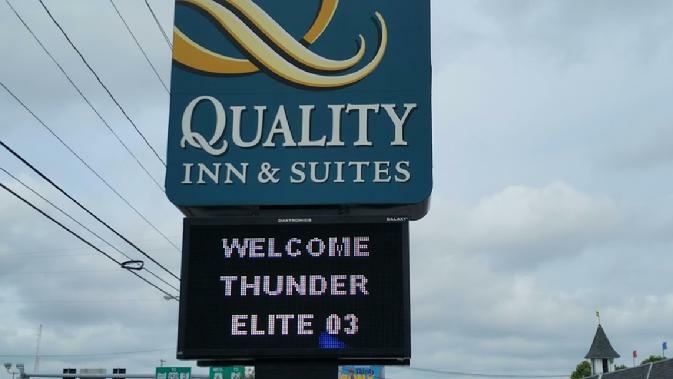 In the Thunder Elite Y-Town Mayhem early-bird tournament on April 25-26 we went 3-2 with wins against XFactor, Disruption (PA) and the Jackson Royals. Our two losses came against the eventual 12u finalists Pittsburgh Spirit Gold and a 7-5 loss to the Wolfpack 02. Next week the team will be playing in the Diamond Dogs Classic in Peninsula Ohio. The picture above was taken in Toledo. (front row) Clutch Ventura, Abbey Nay, Lexi Najdusak, Emily Holland, Grace Crown, (back row) Savanna Eggens, Sydney Bowser, Emily Filicky, Maddie Stein, Mackenzie Herman, and Bailee Beasom. 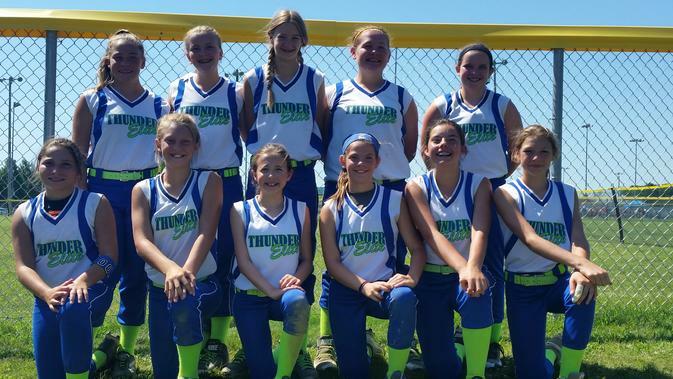 Thunder Elite 03 continues to work and prepare for their 2015 outdoor tournament season. 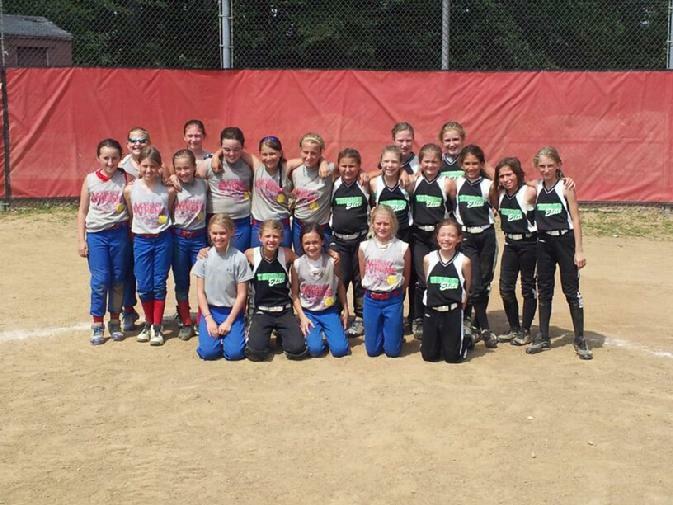 The team had recently been invited to the 12u Friendlies at the Akron Spano Dome on March 28 and had a super time playing against some very strong 12u teams. Pictured above are (front row) Bailee Beasom, Emily Holland, Lexi Najdusak, Clutch Ventura, Abbey Nay. (back row) Sydney Bowser, Emily Filicky, Maddie Stein, Savanna Eggens, Grace Crown, Mackenzie Herman. 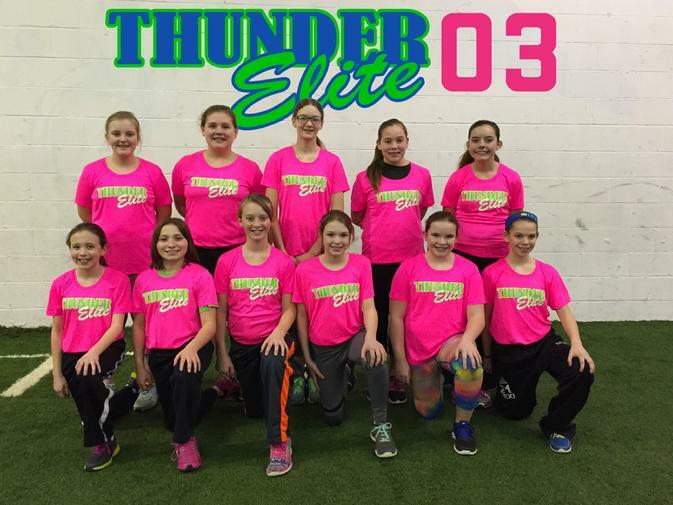 Thunder Elite 03 is having a productive winter season as they prepare for their 2015 outdoor tournament season. The team has maintained a consistent workout routine at their separate indoor facilities in Youngstown and Niles and have committed to individual sessions for the hitters, pitchers, and catchers. For 2015, Thunder Elite 03 has been invited to participate in the 12u Friendlies at The Akron Spano Dome on March 28th and are excited to be playing in the '03 Friendlies in Toledo on May 2 where many of the top 11 year old teams in Ohio will be in attendance. Thunder Elite 10u finished 4-2 at the North American World Series in Columbus, Ohio July 25-27, capping off a very successful 2014 outdoor season for this group of girls. 10u was a very hard working team and it reflected in their 2014 accomplishments finishing with a 32-16 record, including 3 tournament victories and 2 second place finishes. They played a challenging schedule this season and was able to amass an impressive list of accolades such as a 5th place finish at The Spano Dome Spring Tournament, attended Stingrays at Ohio State, OFC Team of the Week for week 2, and was consistently ranked in the top 10 of OFC’s statewide 10u coaches poll. We will now take a couple weeks off before holding our organizational tryouts on August 9th from noon to 2pm and August 16th from 10am to noon. All positions are open for competitive tryouts. If your 03 daughter is interested in being part of a strong team at 11u, please contact Coach Nay with inquiries or consideration for a private tryout. 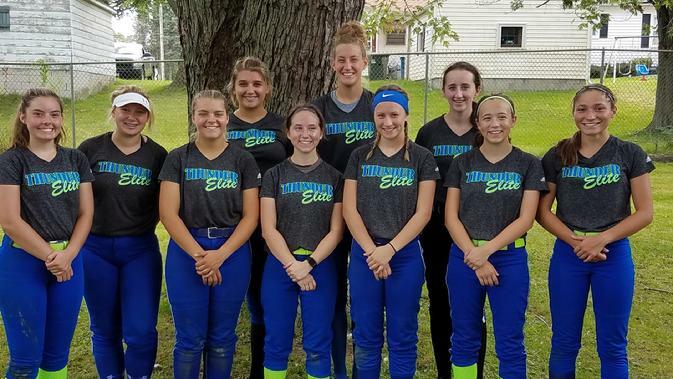 Thunder Elite finished in 2nd place at Sluggers Summer Bash ASA ENQ the weekend of June 21-22 in New Middletown Ohio. The team’s 2014 outdoor record now stands at 27-10 including three tournament championships and two second place finishes! 2014 has been a very good year for this team as they now begin to prepare for an exciting July in Columbus Ohio. The team will be playing at Stingrays on July 11-13 and the North American World Series July 26-29. The picture above was taken at historic Firestone Stadium where our girls had the privilege of playing their opening game of the Akron Summer Slam, June 14-15, against the Ohio Starz. 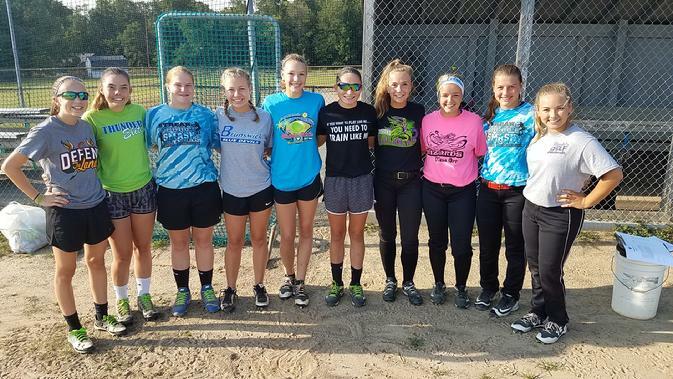 Pictured are Grace Crown, Lexie Drake, Olivia Zigarovich, Hannah Thomas, Grace Schultz, Billie Miller, Clutch Ventura, Abbey Nay, Emily Holland, and Raegan Schick. weekend and will be back in action June 14-15 at the Akron Summer Slam I.
Thunder Elite 10u had a super Mother’s Day weekend in Peninsula, Ohio by claiming the tournament championship in the 2014 Diamond Dogs Classic! Our girls went 5-1 for the weekend against the 10 team field, winning three games on Sunday, including the championship game against ROC Elite 10-2. Our 2014 outdoor record now stands at 14-2. This is our team’s 3rd tournament victory in as many attempts in outdoor tournaments. Pictured above are (bottom row) Abbey Nay, Olivia Zigarovich, (top row) Grace Schultz, Emily Holland, Raegan Schick, Hannah Thomas, Lexie Drake, Billie Miller, Grace Crown, Clutch Ventura. The team will be off this week and will be preparing for their next tournament, The Maple Leaf, in Middlefield Ohio May 24-25. 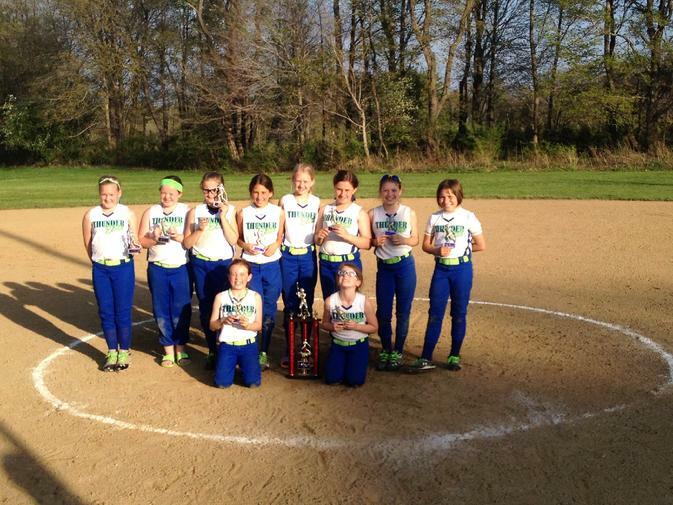 Thunder Elite 10u ventured into neighboring Pennsylvania on May 3-4 and won The Spring Open, NSA WSQ. Our team went 5-0 on the weekend and won the championship game by defeating the Silvercreek Starz 9-1. Other quality wins against the 7 team field were ROC Elite, UC Ice, and the Pittsburgh Roadrunners. This is our second outdoor tournament championship in as many tries for 2014 as this young team continues to improve each week. The team’s 2014 outdoor record now stands at 9-1. With this victory Thunder Elite 10u has qualified for the NSA World Series in Spartanburg SC. Our next tournament is The Diamond Dog Classic NSA WSQ in Peninsula, Ohio May 10-11. Good Luck Girls! 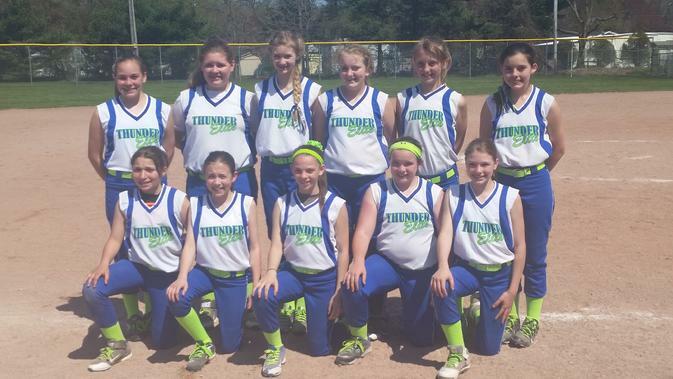 Thunder Elite 10u is off to an exciting start to their 2014 outdoor season! Our team earned this year's first outdoor tournament championship by winning the YTown Mayhem, in Youngstown, Ohio April 26-27! The team finished the weekend at 4-1 and claimed the 1st place trophy by defeating a strong, well coached Diamondbacks team 8-3 in the final. The team's performance showed how their winter preparation has payed off as their bats, defense, and pitching were solid all weekend. Next up for our girls is The Spring Open, NSA WSQ in Hermitage PA. May 3-4. Good Luck TE10u! 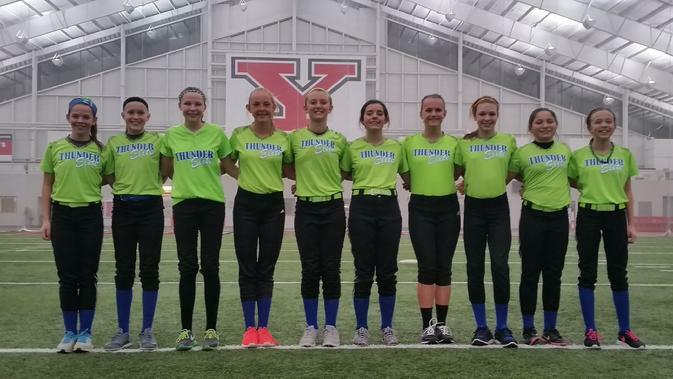 Thunder Elite 10u continues to prepare for the 2014 tournament season with our weekly hitting, glove work, and weekend scrimmages at YSU's WATTS Center. 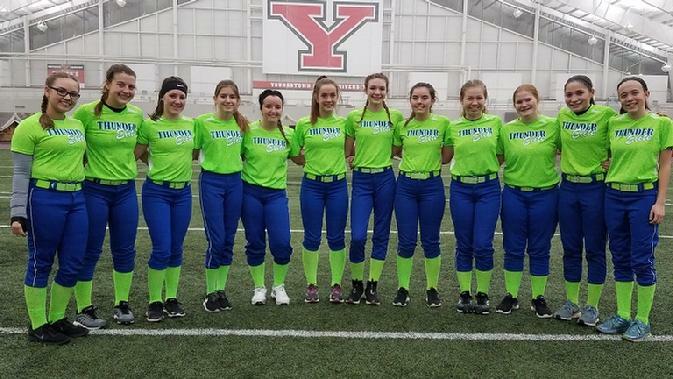 We completed an exciting weekend at the Spano Tournament on March 1st-2nd where twenty of the top 10u teams in Ohio and surrounding states competed at Akron's Spano Dome. It was great to see our team finish in the elite 8 losing to the eventual Spano champion, Ohio Storm 03 by a score of 5-0. Other tough games at Spano included the Pittsburgh Nitro, Ohio Ice Orange, and The Diamondbacks. 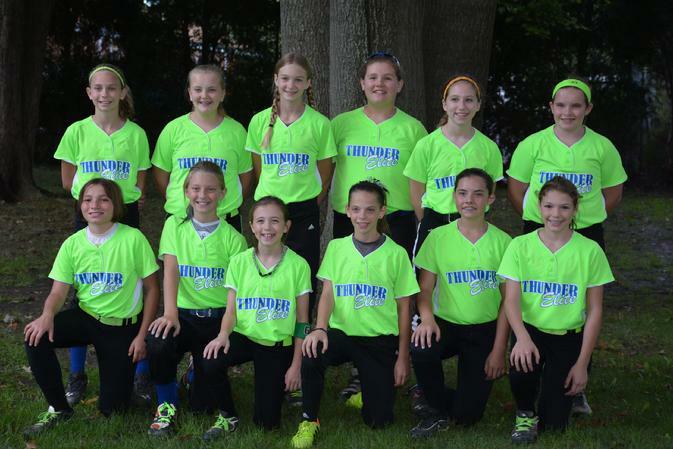 Thunder Elite 10u is made up of 9-10 yr. old girls from Trumbull County in northeast Ohio. 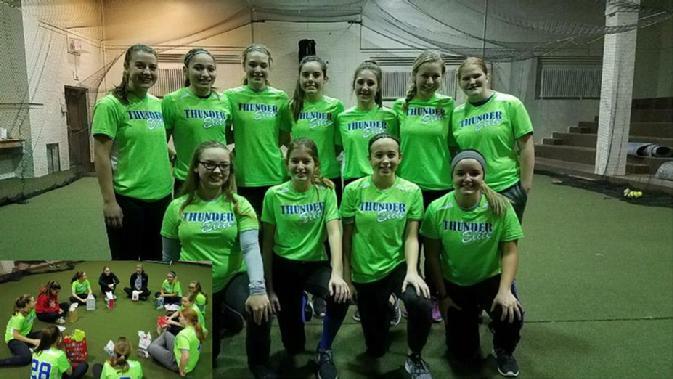 Thunder Elite 10u is a very hard working team and the coaches and parents are very proud of each player as they work towards the 2014 tournament season. 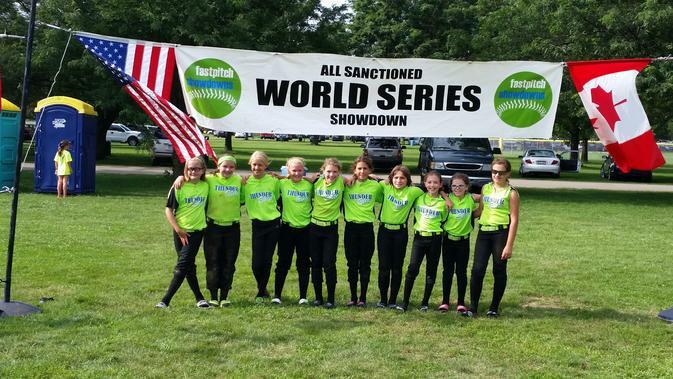 The Thunder Elite 10u girls finished runners up in Hope's Turn at Bat in Mayfield, Ohio July 20-21 as they begin to wind down a very successful year for this young team. Their 2013 outdoor record now stands at 29-15 including 3 number one seeds, four second place finishes, and one championship in tournament play! Along with their solid performance the team has earned a reputation as a gritty, scrappy club that plays fundamental defense and pressures other teams with an aggressive offensive attack. They are a lot of fun to watch! This team was entirely made up with first-year travel players but they held their own against a number of top 10 teams and bigger, more experienced clubs. 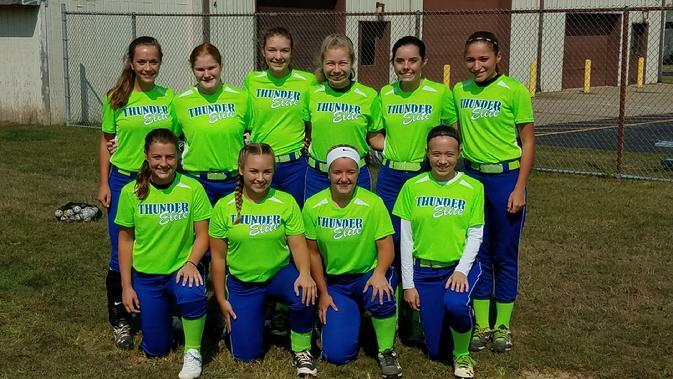 We can't wait for next year to begin as we continue to demonstrate the high standards of teamwork, sportsmanship, and fundamental play Thunder Elite Fastpitch is known for in Ohio and the region. 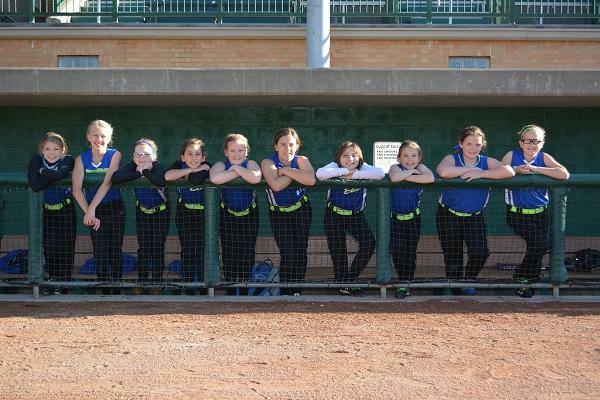 What a great weekend for our 10u girls. They won their first tournament, claiming The Nailbiter NSA WSQ with a decisive 15-2 vicotry over Twisters Fastpitch on July 14. The team went 4-1 on the weekend as the offense erupted for 66 runs on 58 hits. We all knew it was only a matter of time that this young team would claim a championship as they all have worked hard all year and improved in every facet of their game. With their championship win, the team received a bid to attend the NSA World Series in Chattanooga TN. Their outdoor record now stands at 26-13 with one last tournament to go at Hope's Turn at Bat on July 20-21. Great Job Girls! 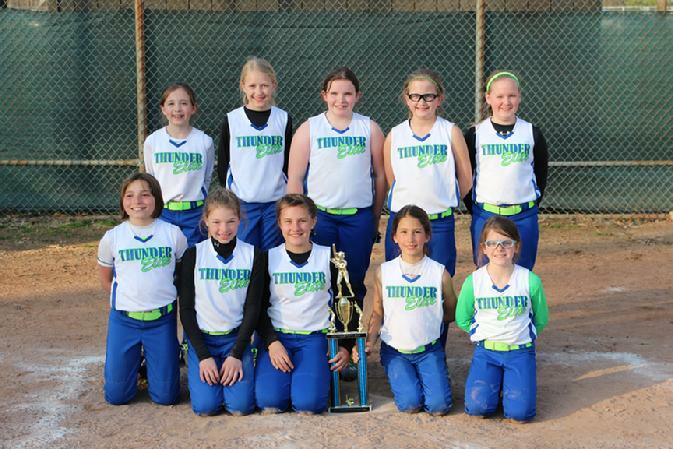 Thunder Elite 10u finished in 2nd place at Sluggers Summer Bash in New Middletown Ohio June 21-24. Despite a 1-2 record in pool play the team put together two big wins on Sunday to make the championship game against Valley Extreme. The girls battled for 13 innings before losing 7-6 in an epic, three hour game in 90 degree weather. They never quit! What a great effort from this young team! 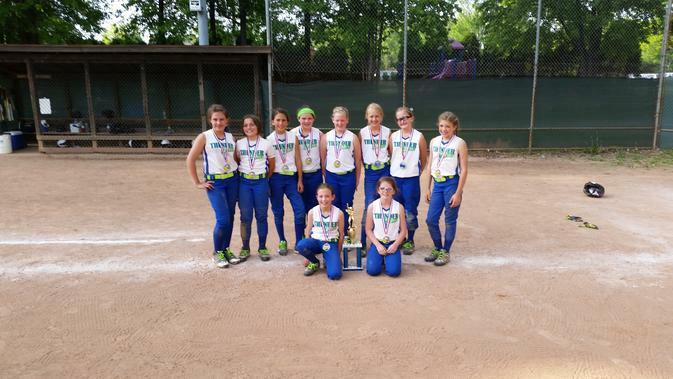 Thunder Elite 10u finished 2nd place at the Willoughby Starzz Invitational June 8-9. The team was 5-1 on the weekend going 3-0 in pool play claiming their third consecutive #1 seed. Our young team played a hard-fought championship game losing 7-5 to the Outlaws. This weekend’s performance improves our record to 19-9 on the season including three #1 seeds and two 2nd place finishes. Pictured above are (front) Grace Crown, Desi Allen. (Middle) Raegan Schick, Alayna Sines, Abbey Nay, Clutch Ventura. (Back Row) Kylie Konwalski, Morgan Sigley, Kylee Sheely, Hannah Thomas. 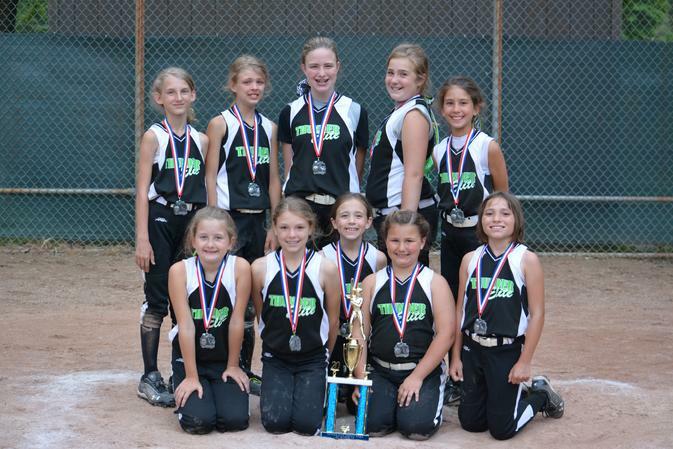 Thunder Elite 10u finished in 2nd place at the 2013 Perfect Storm Tournament June 1-2. The team went 3-0 in pool play and entered Sunday at the #1 seed. This strong showing continues a steady path of improvement for this very young team as its record stands at 14-8, including two #1 seeds in 2013 tournaments. Members of the team are (front row) Raegan Schick, Grace Crown, Abbey Nay, Desi Allen, Clutch Ventura. (Back row) Kylee Sheely, Kylie Konwalski, Alayna Sines, Morgan Sigley, Hannah Thomas.